Published May 3, 2018 at 9:52 a.m. Updated May 3, 2018 at 5:15 p.m.
Chris Rudy of the Ohio Auditor's Office resumes his testimony in former Niles mayor Ralph Infante corruption trial. Testimony in the Ralph Infante corruption trial has concluded for the day with prosecutors just beginning their cross examination of the former Niles mayor. The cross examination will resume at 9 a.m. Friday. Infante took the stand, apparently as the last witness in the trial, answering questions from his attorney about allegations from witnesses that he took bribes, gave former Cafaro Co. president Anthony Cafaro special treatment on fees related to the Cafaro Co. and helped his brother in his brother's job with the city. He testified that he didn't know the rules associated with the retire and rehire of his brother, Joe Infante, and never put money from his annual chicken roast fundraisers in his personal bank accounts. "Absolutely not," Infante replied when his attorney, John Juhasz, asked him if he gave a job to someone as a result of city employee Terry Clay cutting trees down at a home Infante owned on Robbins Avenue in Niles. When asked whether he failed to report the tips that his wife, Judy made while bartending at the Infante bar in McKinley Heights, Infante said he had been given bad tax advice. "We were told that we didn't have to because of five employees or fewer," Infante said. He and his wife later amended his tax returns to report the income, he said. Infante's testimony will resume after a break. Prosecutors will cross examine him after that. It appears that Infante will be the last witness of the trial. Infante, 62, is facing about 35 criminal charges. A few charges were dismissed earlier today — two of them felony bribery counts and four that accused him of receiving improper compensation from an employee who said she gave Infante $1,000 around Christmastime for several years. Ralph Infante has taken the witness stand in his public corruption trial, answering questions from his attorney about allegations from witnesses that he took bribes, gave former Cafaro Co. president Anthony Cafaro special treatment on fees related to the Cafaro Co. and helped his brother in his brother's job with the city. He testified that he didn't know the rules associated with the retire and rehire of his brother Joe and never put money from his annual chicken roast fundraisers in his personal bank accounts. "Absolutely not," the former Niles mayor replied when his attorney, John Juhasz, asked him if he gave a job to someone as a result of city employee Terry Clay cutting trees down at a home Infante owned on Robbins Avenue in Niles. When asked whether he failed to report the tips that his wife, Judy, made while bartending at the Infante bar in McKinley Heights, Infante said he had been given bad tax advice. WARREN — Ralph Infante's defense will present at least one witness in his corruption trial, but it's not known whether the former Niles mayor will take the stand himself. After visiting judge Patricia Cosgrove admitted exhibits from the prosecution's case early this afternoon, she approved a request by prosecutors to dismiss four misdemeanor counts of soliciting improper compensation. 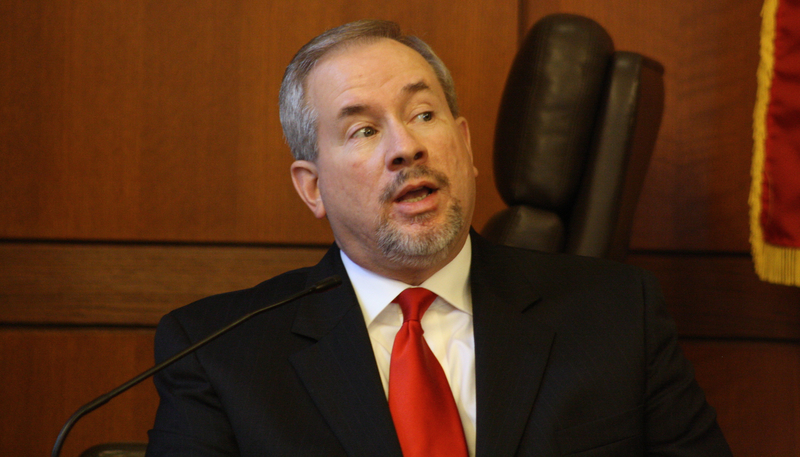 Dan Kasaris, assistant attorney general, asked for the dismissal based on the testimony of witness Karen DeChristofaro, who Kasaris said gave different testimony in court Tuesday than what she had told investigators previously. The judge also dismissed two felony bribery charges related to witness Gabe Marchionte, who testified to giving money to Infante after his sons were hired to jobs in Niles. The judge ruled there was insufficient evidence to prove that the money Marchionte paid was given as a bribe. Prosecutors rested their case this morning at the end of testimony by state auditor's investigator Chris Rudy. At the close of testimony by the defense, jurors will receive instructions and then deliberations can begin. The case is being heard in Trumbull County Common Pleas Court. Today is the ninth day of the trial and seventh day of testimony. Two assistant attorneys general are prosecuting the case. Infante, 63, faces 41 criminal charges accusing him of engaging in a pattern of corrupt activity, bribery, illegal gambling and tampering with records during his 24 years as Niles mayor ending in 2015. At the end of the testimony by state auditor's investigator Chris Rudy this morning in the Ralph Infante corruption trial, prosecutors have rested their case and are preparing the exhibits they want to enter into evidence. Visiting Judge Patricia Cosgrove has dismissed the jurors until 12:30, when it will be learned whether Infante will present any witnesses. If not, prosecutors and defense counsel will give closing arguments this afternoon. After closing arguments, jurors are given jury instructions and then deliberations can begin. The case is being heard in Trumbull County Common Pleas Court. The former mayor of Niles, Infante, 63, faces 41 criminal charges accusing him of engaging in a pattern of corrupt activity, bribery, illegal gambling and tampering with records during his 24 years as Niles mayor ending in 2015. WARREN — Chris Rudy, an investigator with the Ohio Auditor's Office, has resumed his testimony this morning in the Ralph Infante corruption trial in Trumbull County Common Pleas Court. Rudy testified for several hours Wednesday regarding the origins of the Infante investigation and details of the search warrants, records seized and interviewing of individuals who are part of the case. Rudy was a detective in the Jackson Township Police Department in Stark County prior to his current job and was part of the team that investigated organized crime in the Mahoning Valley in the 1990s, he said. Rudy testified regarding spread sheets the state auditor's office prepared using Infante bank records showing large amounts of cash deposits that he said were never reported on tax returns and ethics disclosure forms. Infante's tax preparer also testified Wednesday regarding the Infante tax returns, saying there was no mention of income from gambling or bribery and little mention of gifts. City employee Scott Shaffer testified Wednesday that he paid Infante four times in return for a job for himself and jobs and promotions for his girlfriend and another friend. Shaffer also was among witnesses testifying that he gave Infante gifts. Rudy also testified that during the Feb. 1 search of Infante's home on North Rhodes Avenue in Niles, investigators found lots of documents and $15,100 in cash and checks, apparently the proceeds of the most recent Super Bowl block pool event, not yet deposited into the bank. April 25, 2018 9:29 a.m.
May 2, 2018 12:10 a.m.